The Famous Artists School was founded in 1948 by twelve prominent artists and illustrators namely John Atheron, Austin Briggs, Stevan Dohanos, Al Dorne, Robert Fawcett, Peter Helck, Fred Ludekens, Alfred Charles Parker, Norman Rockwell, Harold Von Schmidt, Ben Stahl and Jon Whitcomb. Collected in this 160-page paperback are the course materials created by the twelve artists. Highlight of the book is you get to read and see the creative process of these artists. The book has included numerous artworks and sketches for each finalised art from these artists so that you can see their process step by step. There's also a good variety of art, style and process to check out. The book covers more on how you can make your art better than the actual techniques. For example, there may be painters who are technically as good as Norman Rockwell, but they may not be able to paint a picture that tells a story as good as him. 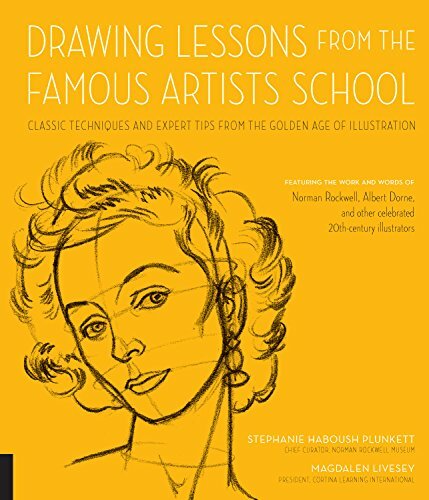 This book will teach you how to make your art as engaging just like the artworks from these artists. There are also lessons for you to practice on your own, and check lists for you to think about. The Famous Artists School as helped more than hundreds of thousands of students since it was set up. The lessons taught are timeless and helpful. You can't go wrong with this book.